Jon Foster's art book, Revolution, will hit the streets any day now. I am listed as an editor but, really, the Fenner's were being very generous with that credit. (Although I am over-the-moon with pride at being so associated with Jon!) Below is the afterward that I wrote for the book. 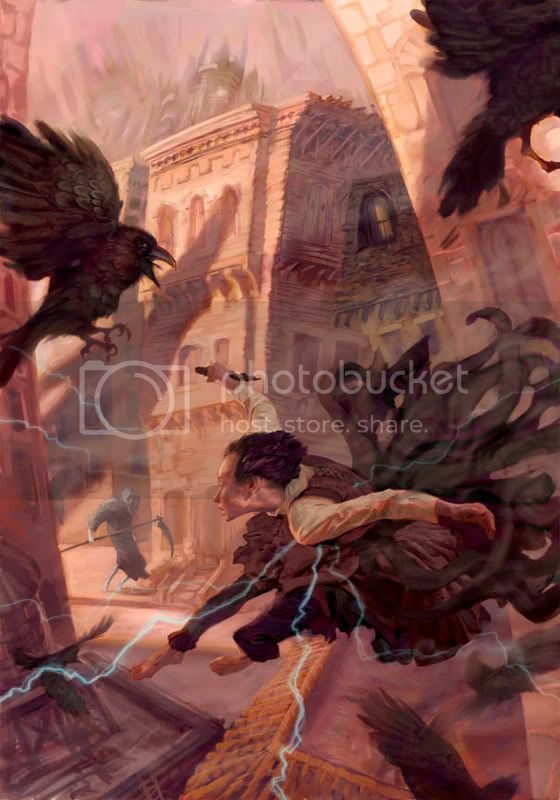 The painting to the left is not in the book but it is the latest cover Jon has done for Tor. It's for the paperback edition of Mistborn. 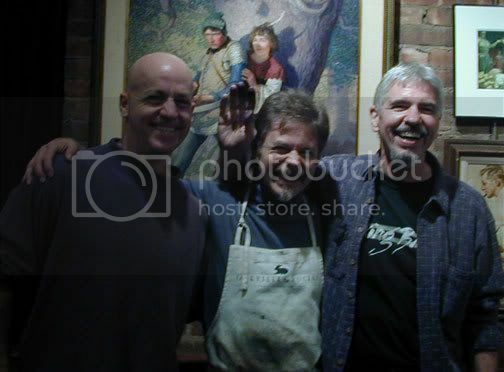 I first met Jon Foster at the 1999 World Fantasy convention in Providence, Rhode Island. I was fairly new to the field but I believed everyone around me when they said that it was the best art show of any convention in the past twenty-five years. The show was phenomenal...I mean, Leo and Diane Dillon were the guests of honor! And yet, amongst that, my most vivid memory of the convention was coming upon a four foot tall painting of a sad-but-sweet robot. His tough, bright red, metal body twisting toward me with big blue eyes and one giant tear -- I just wanted to hold the big guy and let him know everything was going to be alright. I remember that moment because Jon's work, above all else else, packs an emotional wallop that so few artists are able to achieve. From content, to composition, down to the application of the paint, Jon makes you feel what is going on in his worlds...and his worlds are never one dimensional. The delightful paintings often have a underpinning of sadness, the sad paintings are often subverted with a dash of humor, the horrifying images are somehow beautiful...and the loving paintings often have just a bit of rust -- and some dings and scratches -- that makes the characters all the more loveable for their flaws. I can hardly believe that it's only been seven years since that convention. In the years since, he has delivered some of the most innovative and emotionally captivating covers that Tor has published. When working with him it becomes quickly apparent that each project is deeply personal to him: they are not just jobs. Being around Jon is delightful: he is always gracious and quick to laugh but he harbors a large dose of bittersweet sadness that never lets him be satisfied with where his work is. In an industry that requires an artist to stick to one established style, he seems unable, or unwilling, to remain that still. It is his strength of character that allows him explore these vulnerabilities and has lead him to keep evolving and pushing himself deeper with -- and into -- his work. I am grateful for this opportunity to stop and take stock in the accomplishments that Jon has achieved over the first half of his career. In this volume we have been able to catch an artist that is truly in transformation. His substantial body of work has touched the lives of so many people and influenced a whole new generation of artists -- and yet, knowing Jon, I feel that we have only begun to glimpse where he will take us next. 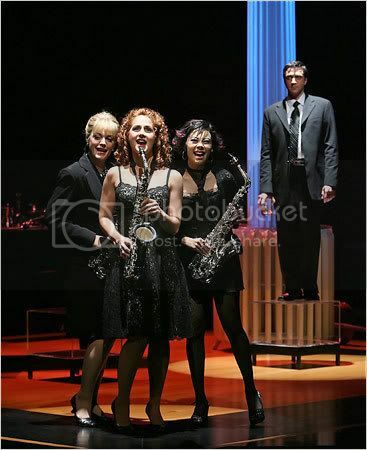 I just got back from the opening night performance of Company. This show is smart, funny, and fantastic! Fire flickers, dangerous and beckoning, beneath the frost of John Doyle's elegant, unexpectedly stirring revival of Company...This visually severe, aurally lush reinvention...is the chic-est looking production on Broadway. The review goes on to praise every aspect of the production but the above relates to my brother's involvement as the set designer so, there you go. Company wasn't one of my favorite Sondheim shows going in (that would be Sunday in the Park...or maybe A Little Night Music...or Into the Woods....hmmm, last season's Sweeny Todd was brilliant......) but this production is remarkable. The Influencer: "I hate it, what do you guys think?" The Optimist: "It's perfect! Just change the color, subject matter, and the composition." Whole Foods hires a full time artist for every store. Who knew? All Things Considered. "I learned to manage myself a lot," Towles says. "If you're an artist, no matter how grungy graffiti you think you are, you need to learn how to be business-oriented." About a year and half ago I commissioned a painting for a book cover. The book was not scheduled but, why not get something done early, right? Wrong. About two weeks ago I was just two days from going to press on the jacket. 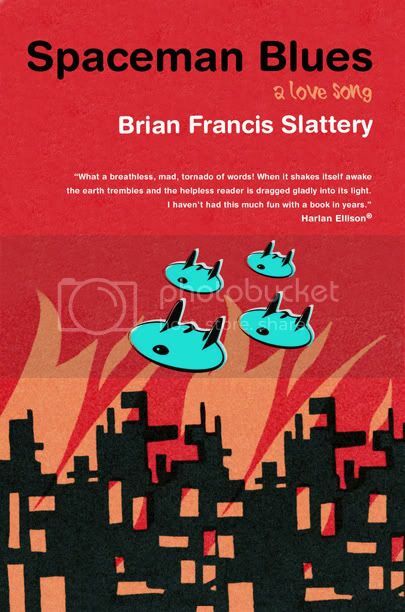 By odd chance I was procrastinating...I mean, doing "important research" online and I came across a cover that was practically the exact same image on an upcoming book -- revamped slightly, the colors shifted a little...but ultimately, the same image. On a book in the same market. Releasing around the same time as ours...Soooo not good. I spent the day trying to contact the artist, thinking that perhaps someone copied their work. As the day went on, and I looked at it a few more times, it became clear that both versions really were...well....the same and must have come from one artist. Even though I had commissioned the piece over a year ago, I had to pull the plug on our jacket. Of course, at that point it had already been approved by the editor, publisher, and sales department, the author had it for months, it was too late to change our catalog, and I needed to scramble around to create a new cover in two days. Really, not good. By odd chance (again) I was attending an annual cocktail party for publishing art directors held at the Type Directors Club. I ran into a friend and started describing what a dreadful day I was having. I didn't name names, I just started describing the painting a bit. They stopped me in mid sentence, realizing that I was describing their cover! They weren't much happier about the situation than I was. They were in better shape, even though I had commissioned the art first, since their book is releasing two months before ours and their jacket has already been making the rounds. Still, they were livid, understanding that it could easily have happened the other way. The next day the artist was highly apologetic (working too hard, didn't realize, etc.) and everything worked out. The second cover might be as good as the first...I've kinda lost perspective on it. 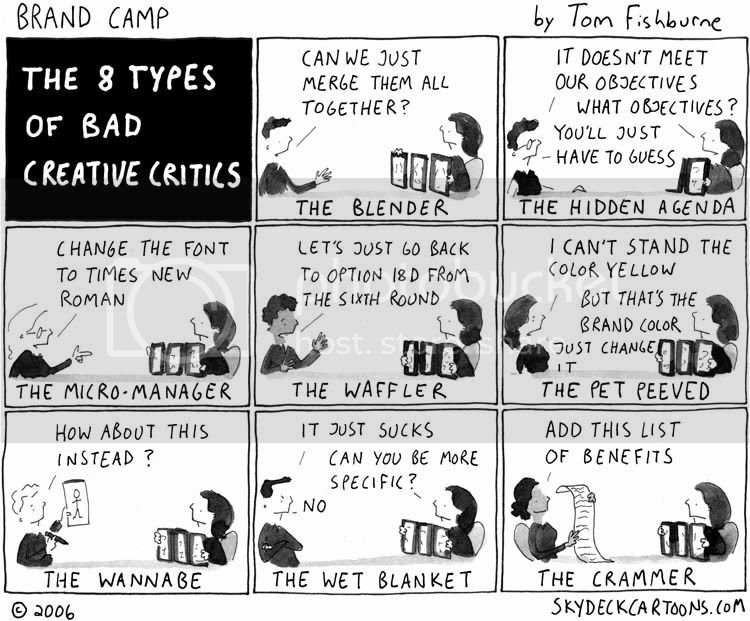 The worst part of it was that, as it gets harder and harder for art directors to work with artists, two of us sat at that TDC party complaining about an illustrator rather than be excited by them. 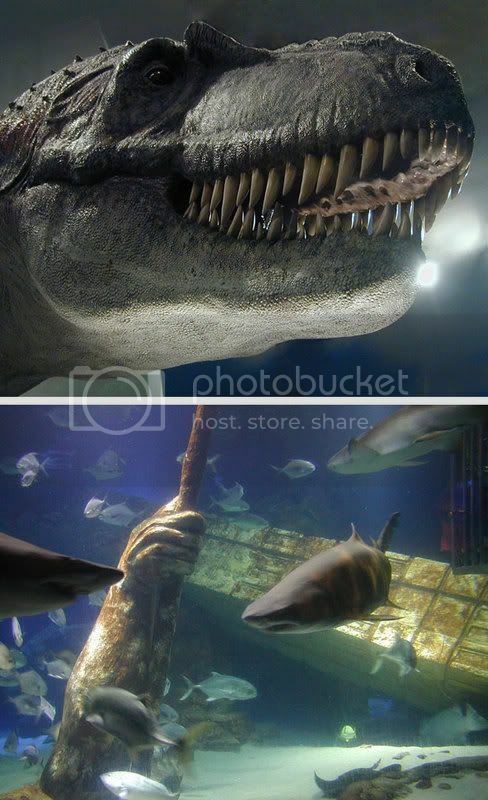 If you're heading to the nature reserve near Flanders Long Island (home of the big duck) and you miss your turn (as we did last weekend) you'll end up Dinosaur Walk Museum and the Atlantis Marine World in Riverhead...Both are well worth getting lost for. Dinosaur Walk looks for all the world like a hallowed out grocery store but, while the exhibit deign may leave a little ..okay, a lot...to be desired, the life sized dinos are really very cool! The Atlantis aquarium also has a cheesey/cool feel to it -- all the tanks have a "The Lost City of" motif that is sorta fun in its over the topness. I'm trying to sneak in and redesign some of the paperbacks that we keep reprinting over the years. (Don't mention all the new covers we should be working on...We just couldn't help ourselves.) 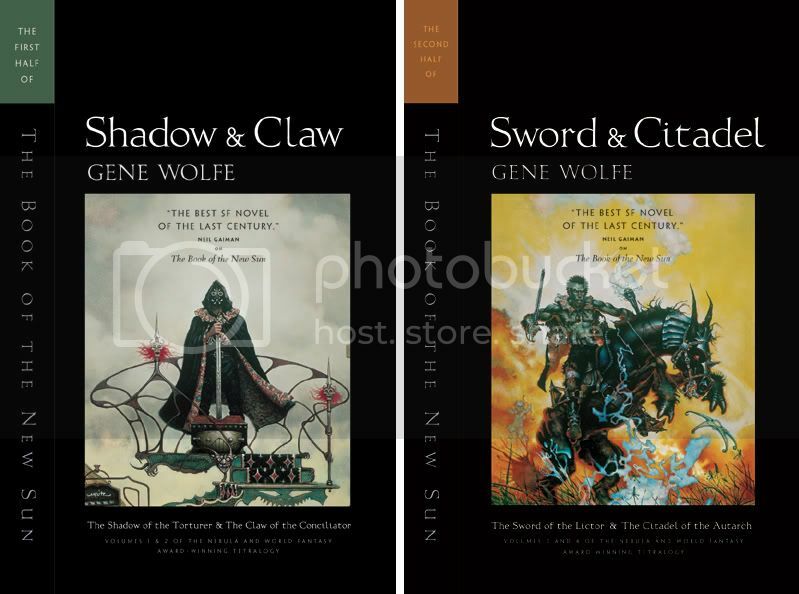 Here is what Jamie Stafford-Hill did with the Gene Wolfe New Sun books using the original Don Maitz art. The first is reprinting now, the second will have to wait until we are out of stock of the current edition. The Society of Illustrators is having its annual Student Scholarship Auction. All the paintings, sketches, and prints are donated by the artists, all of the proceeds are awarded to students during the Society's Scholarship exhibit. I'm reluctant to post about this auction since it is where I have bought most of my own collection...Promise you wont bid on my favorites! For those with deeper pockets, the Illustration House is holding it's fall auction. While I am not in a position to try my luck at the auction block, I still love to see the preview and attend the auction. Once sold, this work is unlikely to be on public display again. 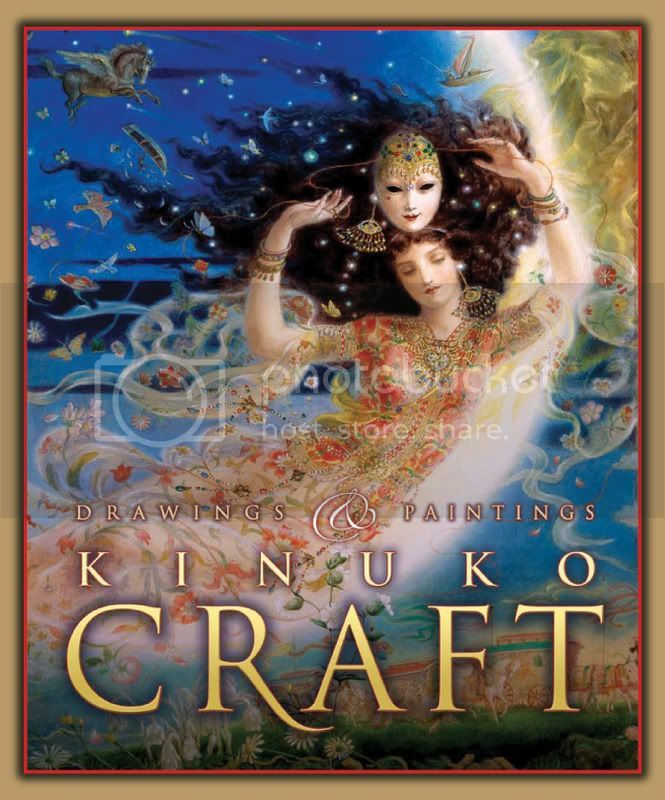 Another great art book is on press, Kinuko Craft: Drawings and Paintings. Kinuko is, hands down, one of best in the business. The book displays covers, opera posters, fairy tales, and editorial work, with some of Kinuko's thoughts interspersed throughout. She is typically a very private person -- preferring to let the work speak for itself -- so this is a rare opportunity to hear her speak out a little. There are a number of sketches included, which I always enjoy seeing. I'm excited to see that there are a number of Tor covers displayed. It's very gratifying to see that the artists are proud of their work for us. The book will be out from Imaginosis in January. CgChannel has a interview with the storyboard artist, and amazing drawer, Dan Milligan. Among other things, Dan is helping to bring Pern and Frank Miller's 300 to the big screen. He's also teaching a Gnomon workshop in Los Angeles in December. I know that I wish I could be in Cambridge this weekend. 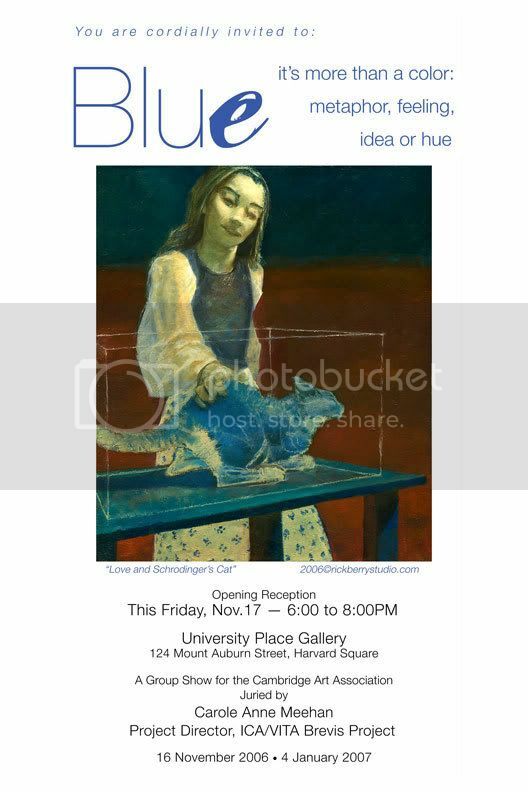 For those of you in the Boston area, Rick Berry will be part of a group show, Blue, at the University Place Gallery. Closer to the pub date (next summer) I'll rant and rave about what an amazing book this is, my favorite in ages...But for now, I'll just enjoy this cover that Peter Lutjen came up with. 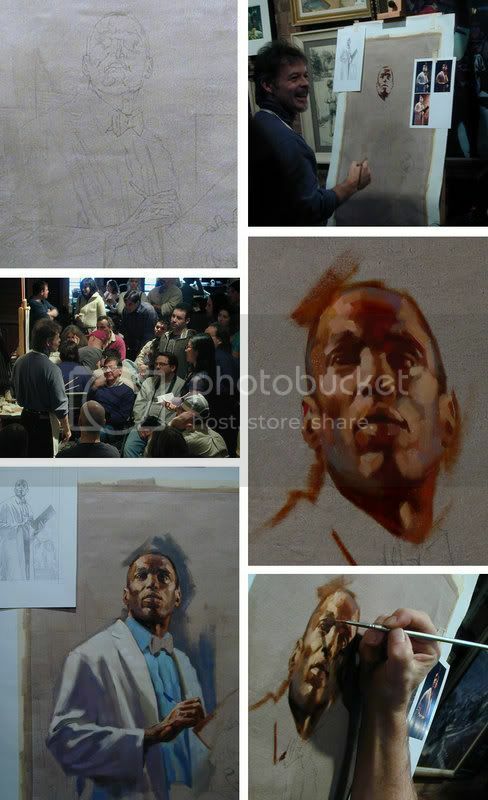 We had three Hamilton King Award-winning artists, Jim Bennett, Greg Manchess, and Gary Kelley -- each with very different sensibilities -- all doing a painting demo at the same time. All of them are natural teachers. They engaged the audience immediately, and, talked and fielded questions for the entire four hours. Any one of them would have been a great speaker on their own but, I suspect, the decades of friendship between them had a lot to do with the warm and intimate atmosphere in the room. 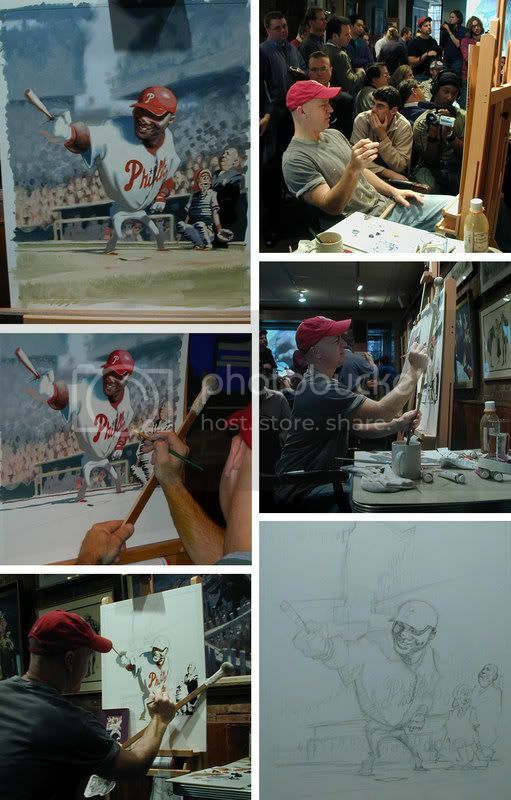 Jim Bennett worked on a image for a 2008 calendar of his baseball paintings. (Anyone that knows Jim, knows that he's a baseball nut.) In the beginning he focused on the important details -- the lead character's expressions, body language, etc. After that, he worked very loosely and off the cuff. He talked a lot about letting himself make as many "mistakes" as possible, "playing around...watching for good things to happen." Otherwise he said that he'd be bored with the image and, "If I'm bored, than my viewer is going to be bored." 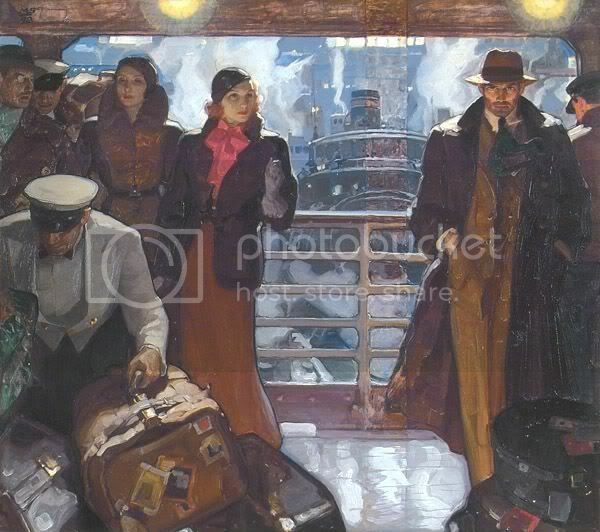 Greg Manchess worked on one of a series of paintings for a new hospital of cardiology. He talked about the importance of value in creating an image, "You can make something any color you want as long as you nail the value." He talked about the importance of good reference, but, that an artist needs to supplement that reference with observation and memory. He mentioned, "You don't get your style, your style gets you." And, "You shouldn't shy away from your influences...they are trying to show you a place you'd like to go." He talked about learning from Gary Kelley and then branching off on his own...while continuing to push himself. "No one is born an artist, it's takes lots of practice and hard work." Gary Kelley worked in pastels on a alternate (un-chosen) sketch for a wine label. 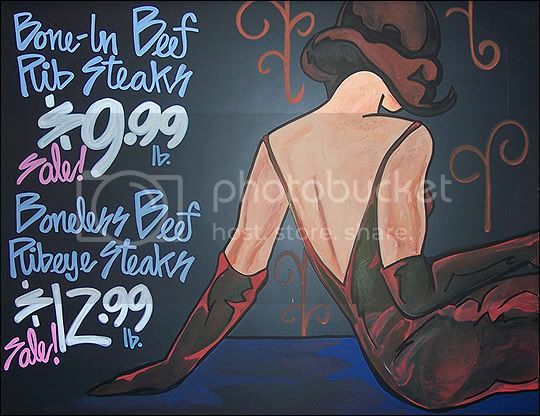 (He graciously donated the painting to the Society Student Scholarship auction to be held December 4th.) Gary also talked a lot about influence and discovery...constantly looking around at situations and artists to inform his work, and, his desire to explore themes in various media -- oils, pastels, monotype, etc. 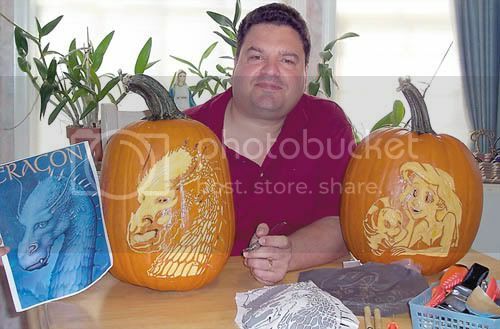 He worked with his fingers as much as he used the actual pastels. He said that a lot of his process is following instinct but, "Instinct isn't about me being who I am, it's about doing a lot of looking and being influenced by the things around me." He stated, "There are no secrets, just years of experience." He spoke a bit about his start as a graphic designer and how that has informed his sense of composition. When speaking about the painting he was working on he said, "I'm looking at this work as a piece of design as much as a picture of something," "I want to retain the feeling that there is still a drawing involved in this piece," and "although I want this to look a little naïve and graphic, there is still something of a Wyeth influence in me that let's me enjoy placing in the details." All in all, a great event. The crowd was full without being cramped. I was particularly gratified that so many people made a point to let us know what a good time they had. 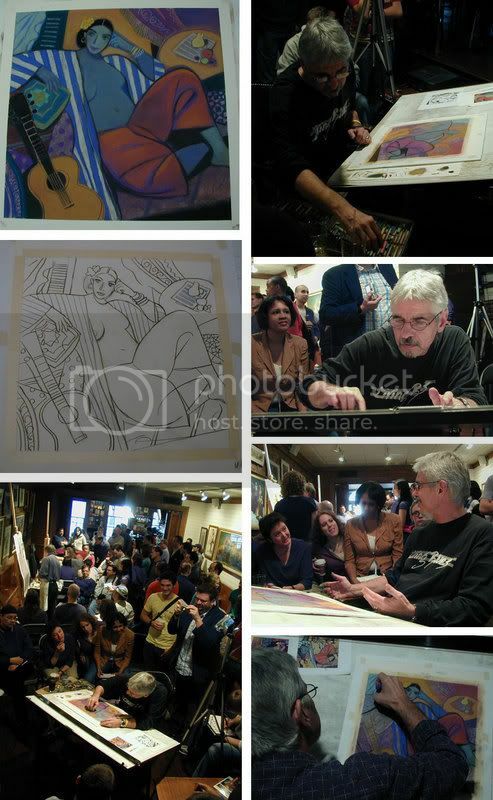 A number of notable artists were in attendance: Peter de Seve, Duglad Stermer, Donato Giancola, Robert Crawford, and others. Two artsit/writers for an online magazine, Resolve40, came to report on it. If I catch that post, I'll update it here. A huge thanks to Gary, Greg, and Jim for being so giving with their time and knowledge. Thanks, also, to Arkady Roytman, Jinju Wantanabe, Rusty Zimmerman, Mike Sysn, and Garret Campbell-Wilson for, once again, helping out. And, of course, thanks to everyone who came out for the event. Very sad news...Stanley Meltzoff passed away yesterday morning. We have lost a truly great artist. He made an indelible mark on the fields of science fiction publishing, mainstream illustration, and wildlife painting. Treat yourself by visiting his website here. "One only has to look at his art to know that his life was rich with poetry." David Apatoff on Illustration Art. After years of winning awards, exhibiting, and being highly collected...John Jude Palencar has finally hit the big time! 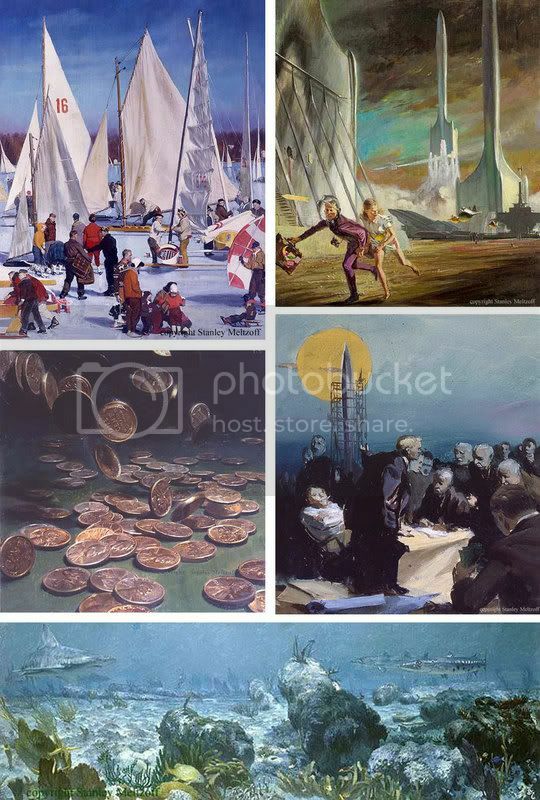 Over at Illustration Art, there is a wonderful tribute to Stanley Meltzoff's historical Greece paintings. ...And if you enjoy that, check out this essay Painting Water: The Marriage of Freedom and Control. Yes, Evil Dead...is now...a musical. My brother, David, did the set designs for the show. 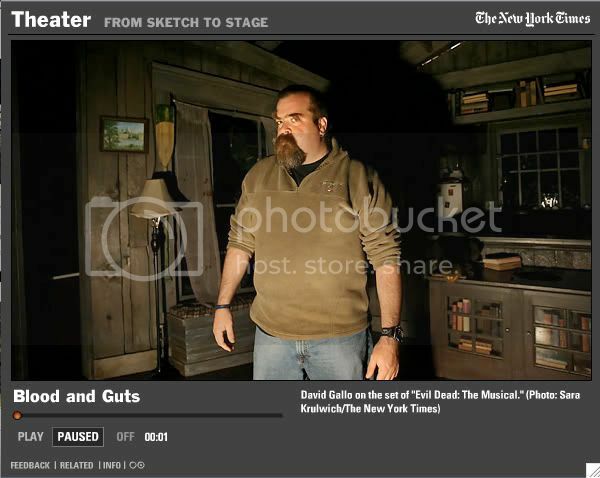 The New York Times review includes a slide show of Dave talking about the look of the play. (Click on the zombie photo on the left.) My favorite lines from the review are, "Evil Dead: The Musical wants to be the next Rocky Horror Show, and it just may succeed" and, "Sure, the show is idiotic, but that's the point." Apparently it's all the rage to wear a white t-shirt and be caught in the blood splash zone. I haven't seen it yet but I plan to soon. For those with more erudite taste, Dave is also working on the revival Stephen Sondheim's of Company. I'm very much looking forward to it. It will be directed by John Doyle who directed last year's haunting revival of Sweeny Todd. The World Fantasy Convention started on a somber note. Our plane had a sergeant escorting a fallen soldier back to his home in Texas. The pilot asked everyone to remain seated on the plane to let the soldiers off first. It was a sad and touching ceremony. 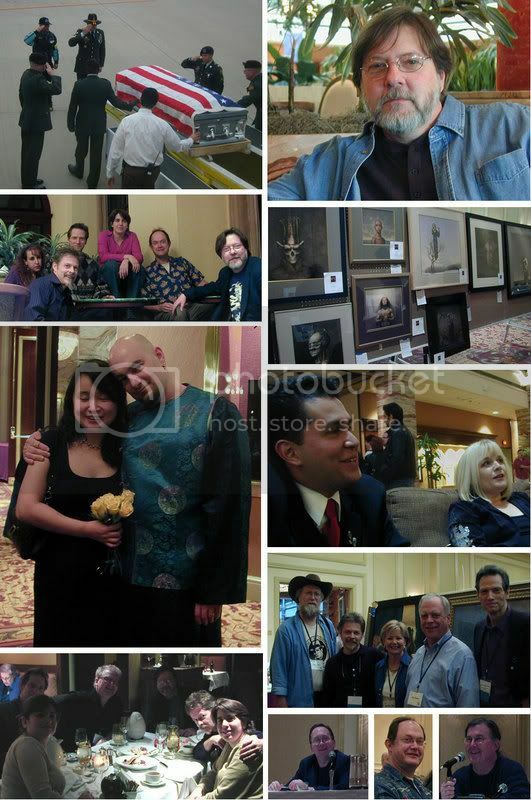 Once we got to the hotel, the convention was one of the most enjoyable that I have been to. I was a bit irked that we seemed to be surrounded by strip malls rather than being anywhere near what I would have expected to be called Austin. Even when you don't leave the hotel, it's nice to be able to sense the city around you. But the company was so good we didn't mind too much. We were able to escape for about an hour on Thursday night to see the hundreds of thousands of bats flying out from Congress Bridge. The locals seem to poo-poo the event, not matching the millions of bats that are seen in the warmer months, but it was still pretty damn impressive. This year's art show was solid! It was smallish, but very high quality. I'll take that over a large so-so show anytime. Palencar brought in 14 large paintings, each one a treat. Gary Gianni brought in four fantastic paintings from Conan, Bran Mak Morn, and Solomon Kane. 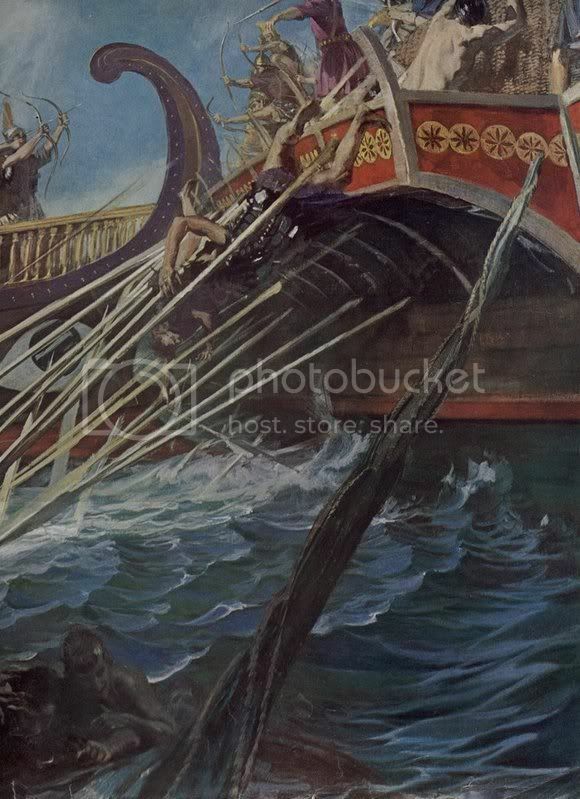 Greg had four paintings from The Conquering Sword of Conan. John Picacio exhibited his book covers and editorial work, including some of his 3/D assemblages. 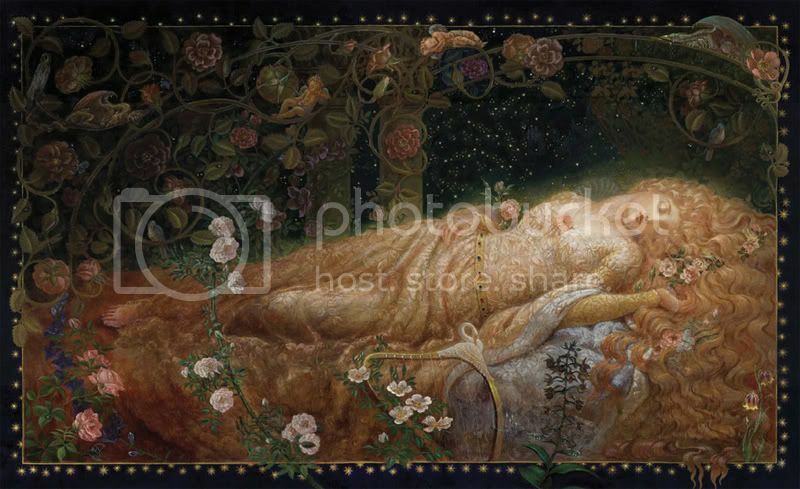 Charles Vess had two color paintings and a bunch of ink drawings from his Susanna Clarke book, The Ladies of Grace Adieu. (Thanks again, Charles, for the book!) Michael Dringenberg had a nice showing, including a work-in-progress. He would work on it each night and then rehang it in the morning. Gary Lippincott shipped in some great work. There was a sculptor there that I had not known before, Vincent Villafranca -- cool robots made of nuts and bolts. The best thing about World Fantasy is that you can actually spend a decent amount of time with people. I had a great time talking with John Jude Palencar, Arnie and Cathy Fenner, Charles Vess, Gary Gianni, John Picacio, Robert Wiener, Andrew Wheeler, Lou Anders, and others. A lot of potential art books were discussed around the bar -- if even just a few of them materialize it will be an exciting time for art books. I was honored (and nervous) to except James Jean's "Best Artist" award at the banquet. Gary Gianni gave an excellent slide show, despite the fact that the projector refused to focus the images. 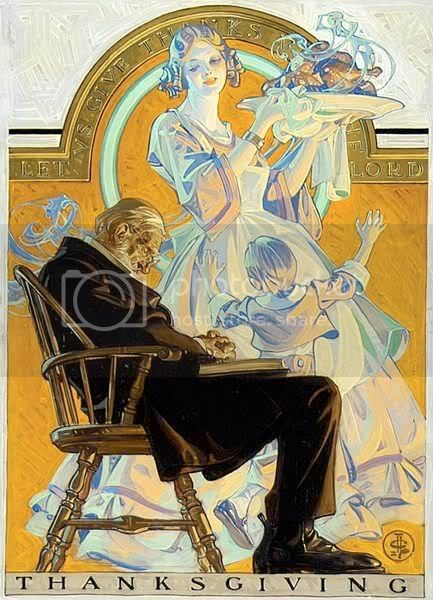 He showed his influences -- Dore, Rembrandt, Wyeth, and others. He also shared his process -- thumbnails to photo shoot, to final painting. He talked a lot about blurring edges, rather than over-rendering, to create a sense of movement. 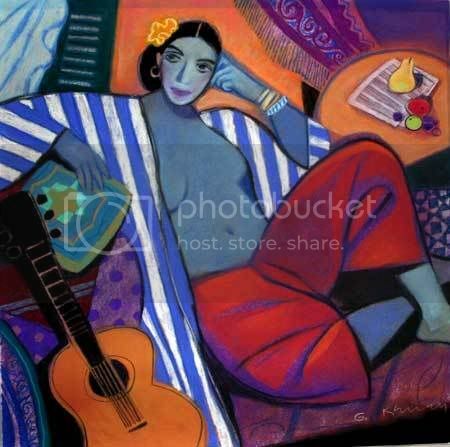 He was able to turn the misfortune of the slide projector into a positive by focusing on the design of paintings ,breaking the paintings down to their essential shapes and groups of figures -- the overall impact of the design rather than the details. Gary is charming, funny, and very smart....the kind of guy you wish could be your neighbor. Sadly, John Palencar's Powerpoint presentation did not work. Instead, Arnie Fenner did an on-stage interview with him. They talked about commission work and gallery work. You could hear a few gasps in the audience when John talked about burning his bad paintings as a means of exorcising them out of his system. When asked if an artist can own a style, he said, "No. Visual language has already been stamped out, we are talking in dialects now." He also stated that, "a good painting asks as many questions as it answers." While sitting in the bar, Charles Vess showed us a bunch of fantasy paintings from the 1800s (I believe) to the present. They were the images from a lecture he gave at the International Conference of the Fantastic. By the looks of it, I am very sorry to have missed that. Hopefully there'll be another opportunity to see him present it. The trip home was, thankfully, uneventful. 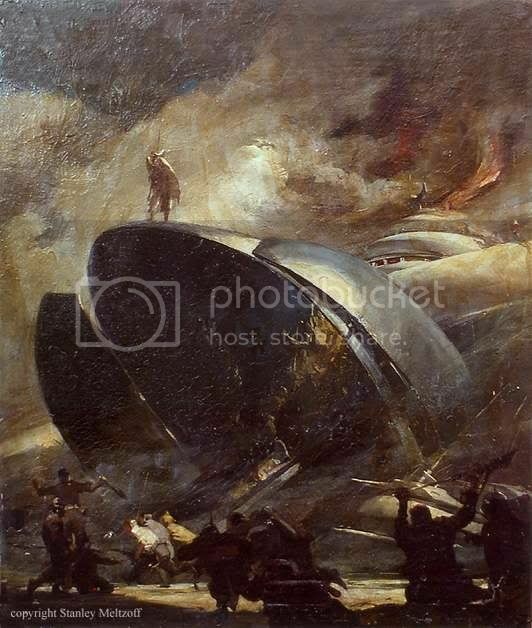 It seemed that about two thirds of the plane were convention attendees -- Gordon Van Gelder, Ginjer Buchanon, Graham Joyce, David Keck, and many others -- just the kind of thing that makes you think, "If anything were to happen to this pl....."